I unintentionally stumbled upon ultra-light bike camping after gifting myself a carbon road bike. It’s one of these goofy, early 90’s models with carbon tubes epoxy bonded to aluminum lugs. After sitting in a garage in Fresno for 20 years, it’s ready to debond with a SPRONG! at any moment. I love it (and check the tubes for wiggle after every ride)! Lacking a rack, or brazons with which to attach one, my bike camping gear with this bike is constrained to whatever I can tie to my bike (or myself) with velcro straps and bike tubes. Now that I’m gearing up for multi-day to months-long off-road adventures, I’d like to keep the minimalist ethos while maximizing self-sufficiency. I don’t have enough patience to be the micro-gram gearhead/engineer type that seems to populate the ultralight bike forums. Instead, I take an empirical approach where I throw a bunch of gear on to my bike and add and subtract as the road-test demands. To get started though, I’m collecting as many gear lists as I can from Tour Divide racers. These folks ride from Banff, Canada to the border of Mexico on minimal setups. I love that in the bikepacking world, I can stand on the shoulders of giants who generously share their trade secrets. Advice #2: Though I think my Crank Brothers multitool is a brilliant piece of engineering, Matthew Lee, multi-time Tour Divide champion suggests taking a set of allen wrenches and a separate multi-tool. Additional sensible advice can be found in this article from Adventure Cycling. Image from Salsa Cycles Blog. I like your sensible approach to bike touring without getting obsessed about weight. 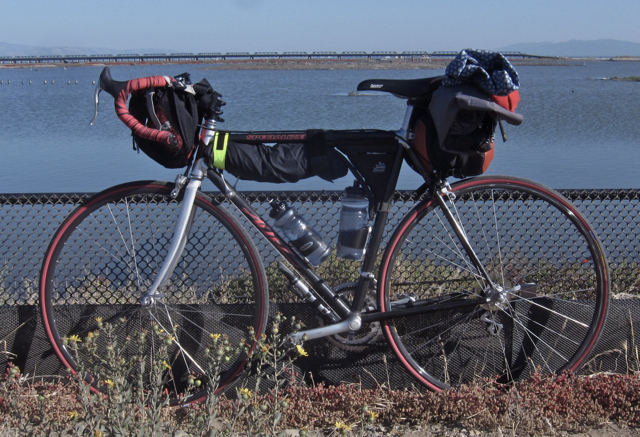 You might find my thoughts on bike touring without racks and panniers an interesting read. Thanks for posting and I especially liked reading about your Mexico travels. Happy adventures. Thanks for dropping by! Love your blog, it is so inspiring to see other folks traveling the world. Drop me the link to your page about bike touring sans rack? Thanks for sharing your knowledge on packing light. Do be kind to your Specialized Allez. Those were some wonderful handling bicycles. And they were tough as nails. The only one I ever saw break was crashed into a barrier by a masters level racer at 30+ mph. It broke the top and down tube right at the head tube junction. We used the down tube and chain stays for pry bars at the bike shop through the rest of the 1990’s. Joe! Thanks for checking out the Flaming Bike! I have since retired the carbon Allez due to my sheer enthusiasm for riding road bikes on dirt and singletrack. While the frame seems intact, I was just really pounding it and didn’t psychologically trust it anymore, even if rationally everyone tells me the early carbon frames were overbuilt and attached together with aircraft grade epoxy. Additionally, it is also the only bike I’ve ever ridden where I’d think, “Man I’m going to fast.” It got speed wobbles on descents and that translated through the frame in strange ways. So now I’m riding a lugged steel Allez from around the same era! It came with full Shimano 600. I put in a full drivetrain upgrade to a compact double and a 32/12 cassette to make it a minimalist touring and randonneur shredder, and I never worry about it on my inevitable off-road asides. Which all reminds me, I should post up my latest bike build and kit refinements. Thanks!